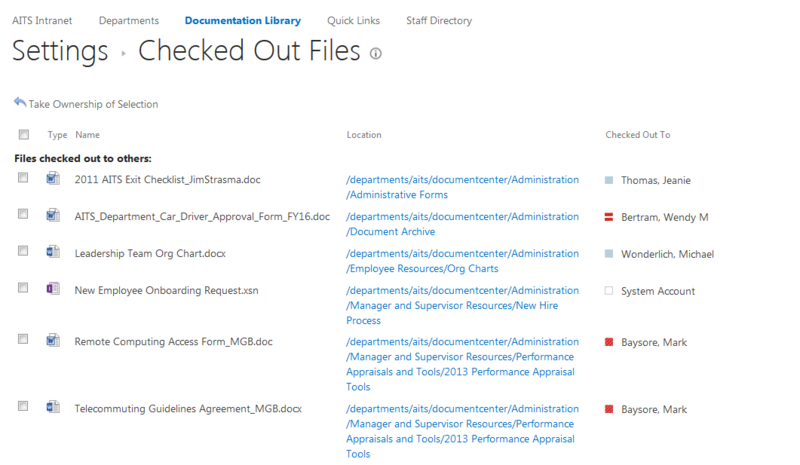 SharePoint - Steps to delete a locked or checked out document that is checked out by someone else. Site Administrators can take ownership of the file(s) and then check them back in. 1. Launch site/page where documents are located. 2. Select the Library Tab and click on Library Settings. 3. In Library Settings, select the "Manage files which have no checked in version" option. 4. Select the specific document you want to take ownership of. 5. Click on "Take Ownership of Selection" link at the top of the list.